There are a few commercial airplanes that have a shower spa on board, but none quite as nice as Emirates’. Made famous by Jennifer Aniston in a TV commercial, it is fantastic. My whole trip to Dubai was planned from the beginning so I could fly on the A380-800 and experience the Shower Spa. I was able to experience it using Emirates’ Stopover in Dubai. Here is my review of DXB-ICN on A380-800. I booked this flight before Alaska suddenly devalued Emirates awards in March, 2016. 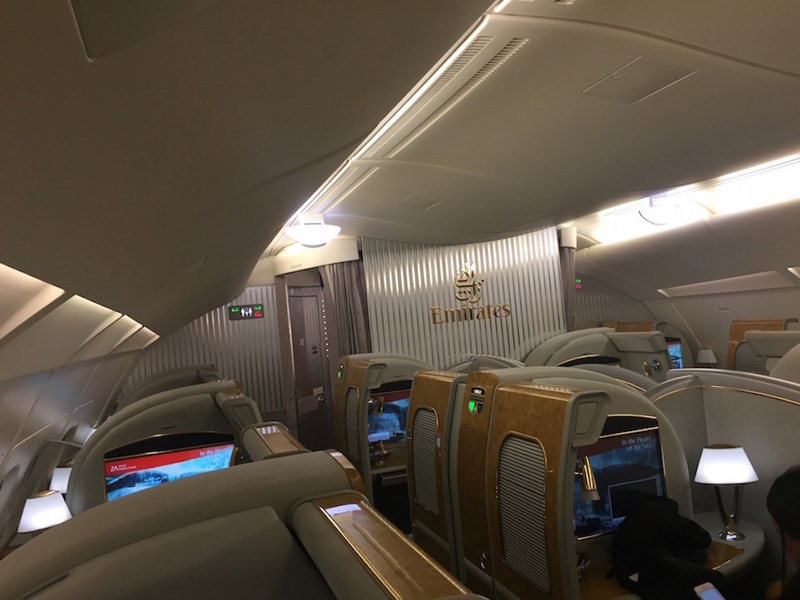 The cost was 90K miles to get to Dubai (see my review of First Class on the B777-300ER) and only an additional 10,000 miles to add on a connection to Korea. One of the crazier things about flying out of the Middle East is departure times. My DXB-ICN flight was scheduled to depart at 3:40 am. Yes, 3:40 in the morning. (Yawn!!) First Class passengers use the first connecting bridge direct to its cabin. This time, I decided to be on the left side of the plane. It’s A380-800 suite, Suite 3A with all kinds of fancy features. The first class cabin is comprised of 12 seats in a 1-2-1 configuration. There were 7 first class passengers. For me, it feels little tighter in the cabin compared to the Emirates B777-300ER. You can see the (almost) whole plane and Dubai Airport before the departure from the screen. This plane had a tail camera attached so we were able to see everything. One big difference between the 777 and the A380 is views. Unfortunately you don’t have a great view through the window in the A380-800. My 8-hr flight to Korea began with the glass of champagne and warm mixed nuts. Stairs to the 1st floor, Economy cabin. The first class bar area (above) is rather small. After looking around a bit in disappointment, a flight attendant guided me to the back of the plane where the much larger business class bar is located. This is the Emirates Business Class Bar, located behind the Business class cabin on the 2nd floor. They have a huge selection of food and drinks. Some flight attendants were also mixing cocktails at the request of passengers. I was drinking Dom Perignon from First Class, and they did not have one in the bar since it is not available in business class. After discovering what I was drinking, the flight attendant made a quick call and the Head Purser showed up in a minute with the fresh bottle of Dom. Amazing service!!! I had a great time, and memorable moments in this area. Who would have thought about getting an instant photo shot up in the air? They brought a polaroid and asked other flight attendants to be gathered for the photo shoot. The two photos turned out fantastic. “Make moments to remember” Yeah, I’m doing it. I had a fruit plate with my drinks, and this yogurt was served with it. It was so good but I still don’t know where to get it. From my search on the web, it is from Ireland, and that’s all I know. When I was on board, one of first class cabin FA asked me these questions before take off. It amazed me how they are so detailed about their passengers. Actually, I was taking a nap during the flight, and they woke me up. It was about 1:45 before our landing. Time for the shower! The Shower Spa is located in he front of first class cabin. The entrance is on the right, and the shower booth is on the left. The entrance door needs to be locked to turn the water on in the shower. You can see the size of the shower booth here. You will have full tank of water when you walk in. According to them, the full tank runs about 5 minutes, and the shower stops once at the 4 minute mark to let you know that you have one minute left. This is when the shower stops. I had to push the green button one more time to get the rest of my water. Time management is the key~~!! While I have taken numerous showers in airport lounges, this was my first time taking a shower in the plane. I felt very fresh after the 5 minute hot shower and was able to get ready to meet my family at the airport in “better shape”. I ordered Chicken Congee for my breakfast before landing, and was very good. I was eager to be on this A380-800 with the Shower Spa for a long time, and was so happy to finally do it. With my experience on B777-300ER (DFW-DXB), this is one of the best flights I’ve flown ever. I enjoyed every bit of it. Their meal, drinks, service, Shower spa… Bar, and those memories from the photo. Amazing. I spent 100K Alaska miles when I booked it, and it takes 180K now due to the devaluation. Two First Class flights using 180K Alaska miles…. I still feel it is worth it for the experience. Between the two flights, you get an entire day of First Class treatment! Have you flown in First Class on the Emirates A380-800 with Shower Spa? Share your thoughts and experiences in the comments!